From Lazydays at Seffner, we took advantage of a end-of-season weekly offer at Williston Crossings RV Resort. We would be joined by Pam and Ernie, who left Seminole a week after us. 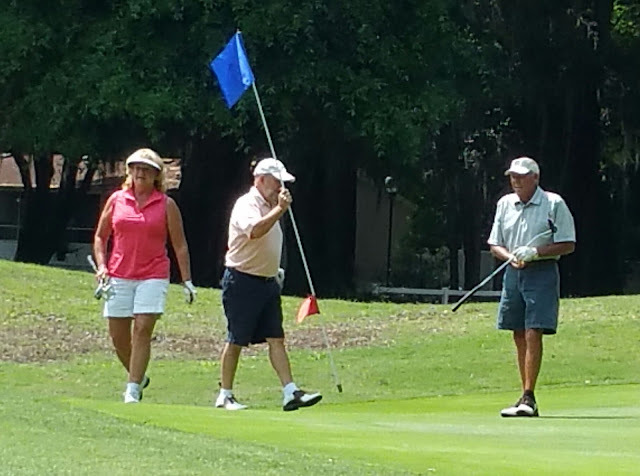 They had relatives in the area and would get to see them and we would get to play golf. 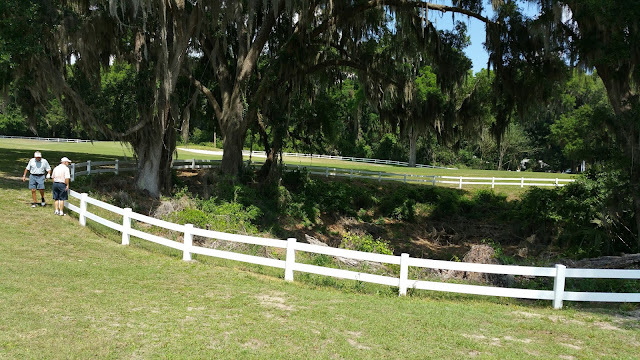 Our site at Williston Crossings was nice, shady in afternoons and comfortable, but Pam and Ernie's site was extra special with beautiful lush grasses, shrubbery and a lovely view of the campground's covered bridge. I unloaded my bicycle and the dog's stroller and enjoyed riding the nice, smooth paved campground streets. This is where I would put finishing touches on the room rugs and runners I had cut from our carpet remnants. 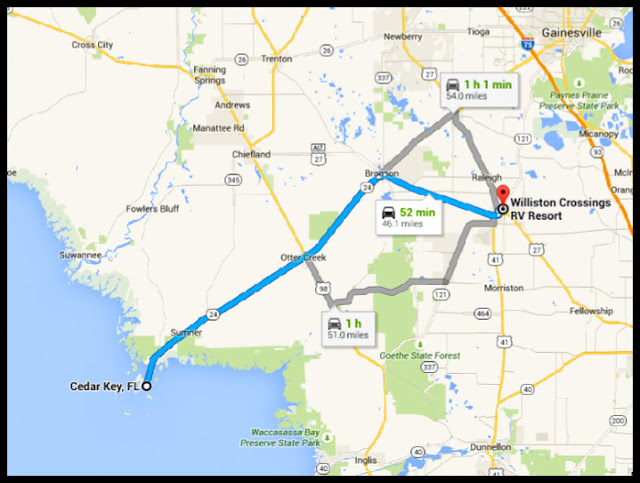 Williston Crossings would be a great place to spend the winters if it were a bit farther down Florida's peninsula. The town of Williston is in the west central part of the state and north of the the frost line. The folks here had several nights of below freezing temperatures this winter. The weather was bordering on hot now but we managed to get in two days of golf. 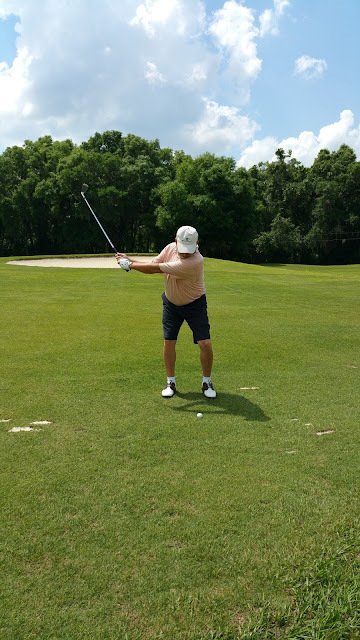 Our first outing was at Williston Highland Golf and Country Club which we imagined would be a real nice experience. No requirement for a T-time should have been the first clue that we might be wrong. We arrived to find the property in a state of terrible disrepair. The clubhouse was dark, musty and void of guests. The single employee who served as bartender, pro-shop operator and cook, prepared hot dogs and ham sandwiches for us and we devoured them with gusto. 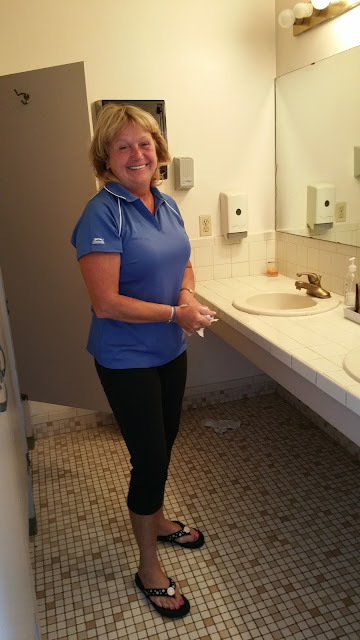 After lunch Pam and I made our way through the darkened clubhouse corridors to the ladies room and found ourselves in hysterical laughter remembering how our friend, Sue, loves to have her picture taken in the lounge areas of well appointed, lavish country club bathrooms. She shares them with her sister for fun. We couldn't resist taking these pictures for Sue as we knew she would envy us today. 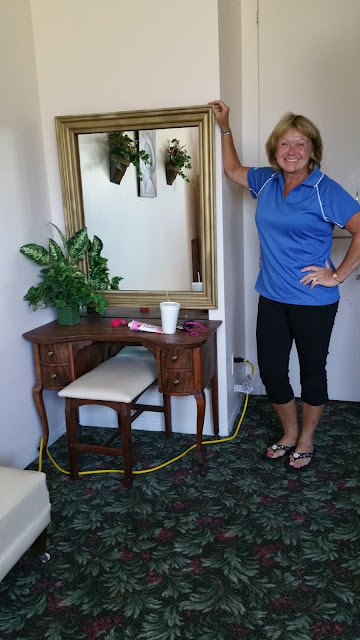 Pam is in awe at the beautifully appointed state-of-the-art lavatory. A moment for me to relax in the sumptuous lounge. Finished "freshening up" at the dressing table and ready to hit the links. If anything could be worse than Williston Highland's Club House, it would be the golf course. The grasses are similar to that found in poor cow pastures. Great clumps of asphalt, large swaths of dead grass and huge piles of unidentified sandy material dotted the course. It was a hoot but we enjoyed the play. After about 12 holes, we called it a day. I had developed soreness in my chest caused by costachondritis I developed a few years ago. Hoping I could "work out" the soreness in my rib cage, I played with the pain but later regretted my decision. By bedtime, I could barely move my upper body and had to begin an aspirin regime that went on for more many days. I had to change my sleeping position too. No more stomach sleeping for now. Another day we took a 45 minute ride out to Cedar Key along the coast just to while away the day. 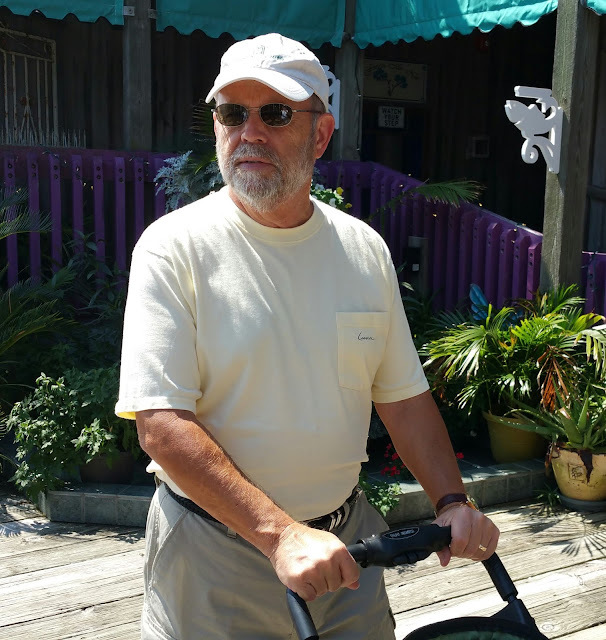 Years ago, Wayne and I had been to Cedar Key but I had forgotten most of what we saw there. 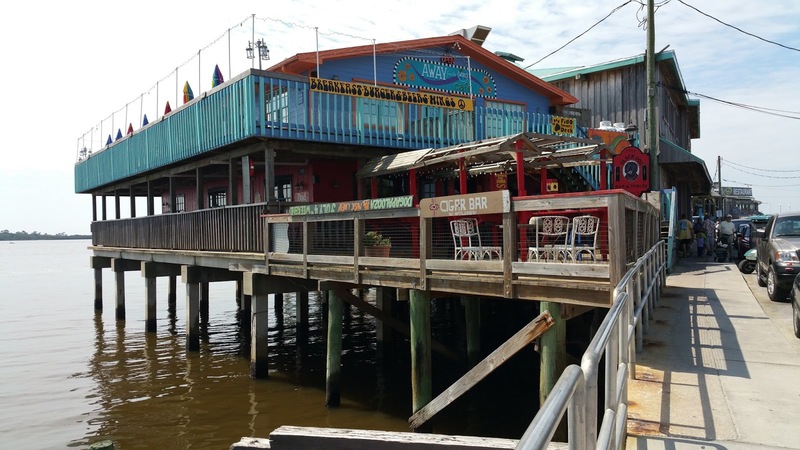 Cedar Key is an old fishing village, tourist trap and festival locale, hosting an art festival in spring and a fall seafood festival. There are a few regionally notable restaurants too. Pam on the left. Me on the right. The daytime high temperature probably got to near 90 but a bit of sea breeze kept heat exhaustion at bay. A short walk around the island caused an insatiable appetite for ice cream which we finally did locate and devoured. Handsome Pop takes a turn pushing the pups too. 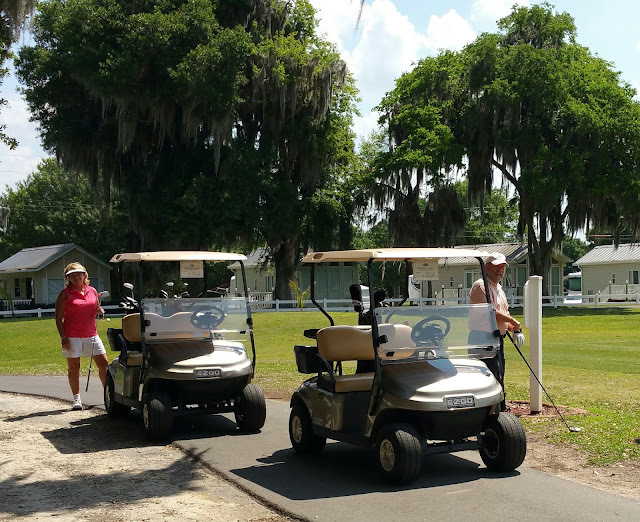 Our second day of golf was at at Grand Lake RV Park and Golf Course in Citra, Florida. This outing took us west beyond I-75. Still suffering with costachondritis, I rode but didn't play. 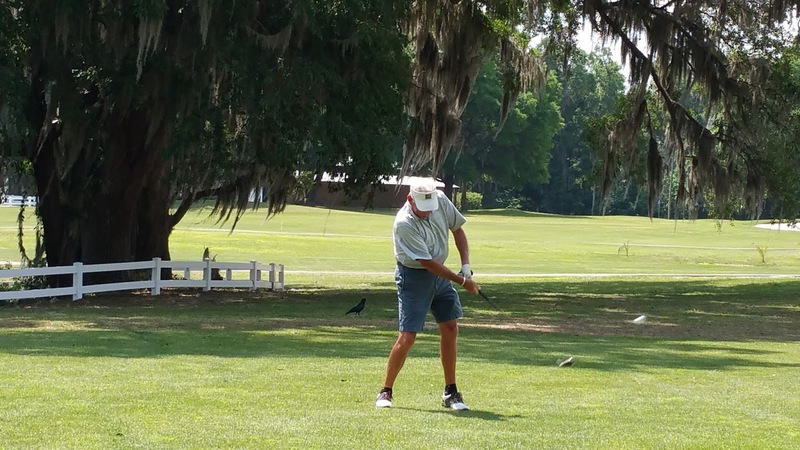 This course was in as good or maybe better condition than any we've played and I really wanted to play but couldn't risk worsening the inflammation in my ribs. Teeing off at #1. 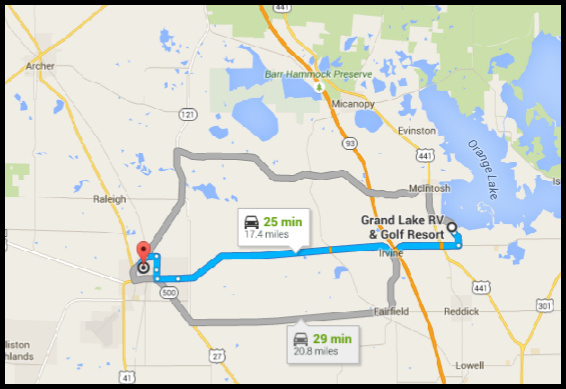 Grand Lake RV Park has several park models, lots of space for transients and lots of trees throughout the property. They have a nice restaurant where we ate lunch before golf. Located between Gainesville and Ocala, Florida, Grand Lake has a nice campground and golf course. Pam and Ernie had stayed in the campground last year but had not played the course. We found it to be quite nice -- green and well kept. Ernie: "Can't find my ball." Wayne: "Let's go over the fence for it." Wayne showing off his excellent "old dude" form. We stayed on at Williston for a few days after Pam and Ernie left. They would make stops at Mexico Beach and then Destin before meeting us at Gulf State Park Campground in Gulf Shores the week after Easter. 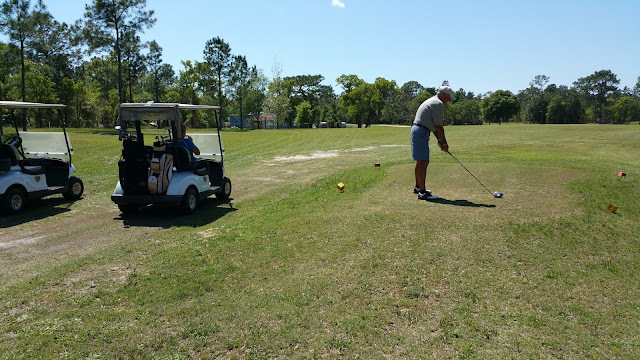 Wayne and I arrived in Gulf Shores a few days ahead of Pam and Ernie but couldn't get into Gulf State Park so we checked in at Anchors Aweigh RV Park until the spring break weekend was over. During this time, we enjoyed another nice but short visit with friends Frank and Beverly, who now live full-time in Gulf Shores. One of the best Mexican lunches we ever ate was with them at Cactus Cantina on the Parkway near their home. Shrimp with black beans and Mexican grits. Yum. Frank and Beverly. I didn't take this picture. Actually I'm ashamed to say I failed to get a single picture of them. 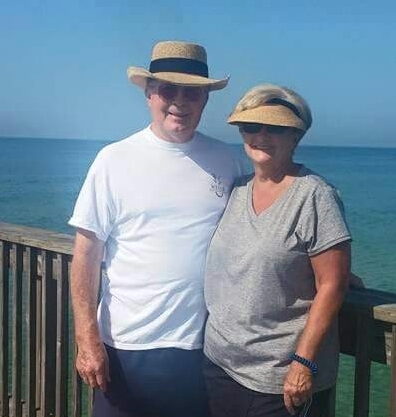 Pam and Ernie arrived after Easter and got to their campsite at Gulf State Park Campground while we were still at Anchors Aweigh. 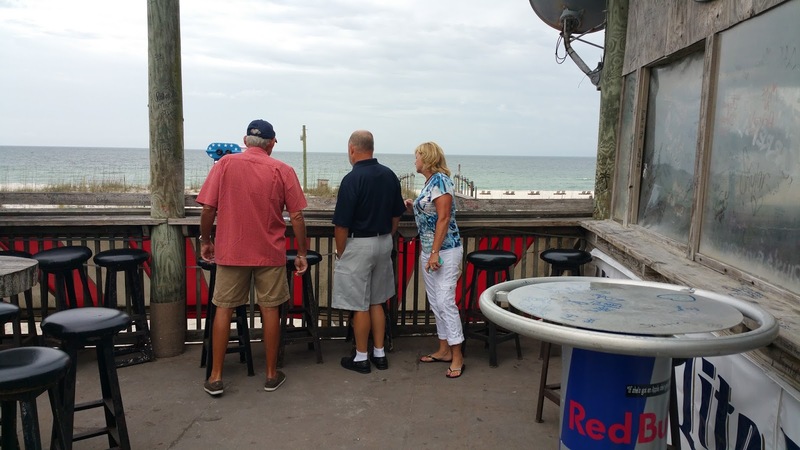 They also have friends who live in Gulf Shores so they got in several visits with them too. Another good thing about our full-time RV'ing lifestyle is that we can visit with our friends all over the country. 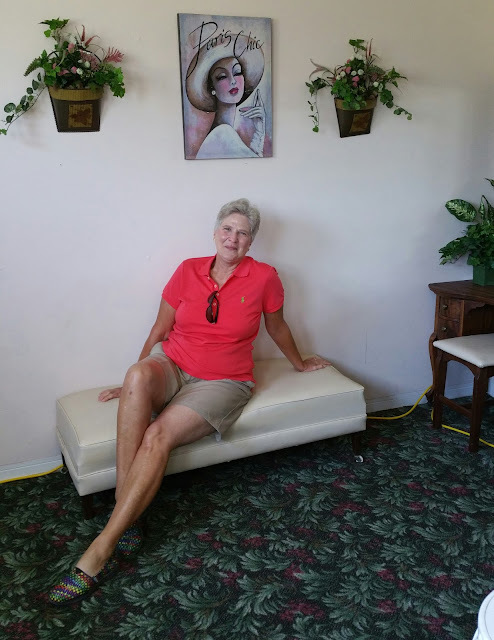 Pam and I had planned, and looked forward to, eating at Lambert's, Home of Throwed Rolls in Foley, but we changed our minds when we learned how dreadfully long the wait would be... along with some poor reviews of the restaurant's service and food. We did enjoy eating at Baumhowers in Orange Beach and King Neptune Seafood at Gulf Shores. Another place we visited but didn't have anything to eat or drink was at world famous Flora-Bama, the beachside bar on the Alabama / Florida state line. I won't try to explain or describe this establishment. The photos that follow give a pretty accurate depiction. 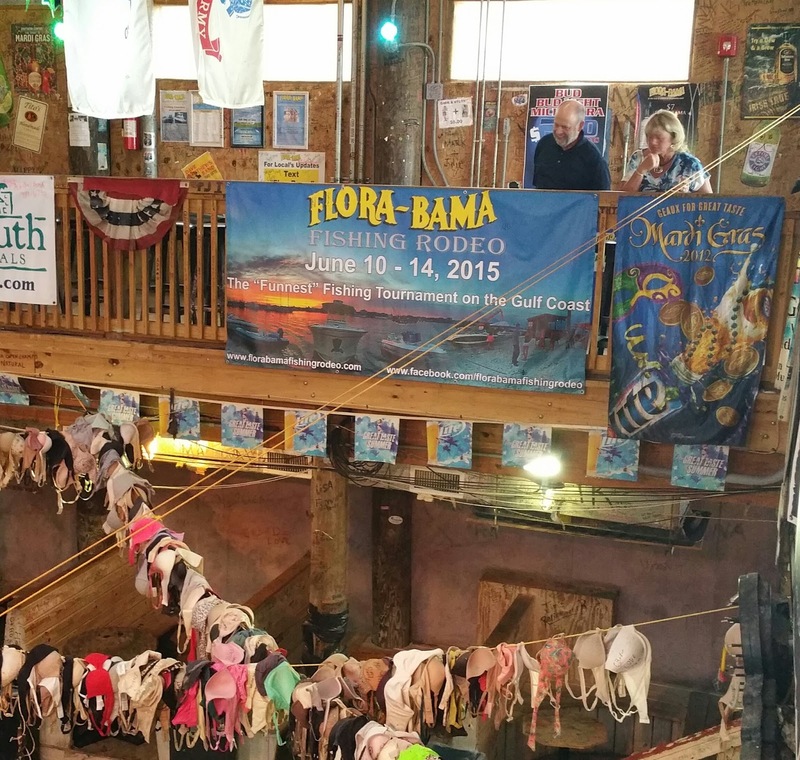 This picture was taken in the Flora-Bama gift shop for our friend, Joyce. 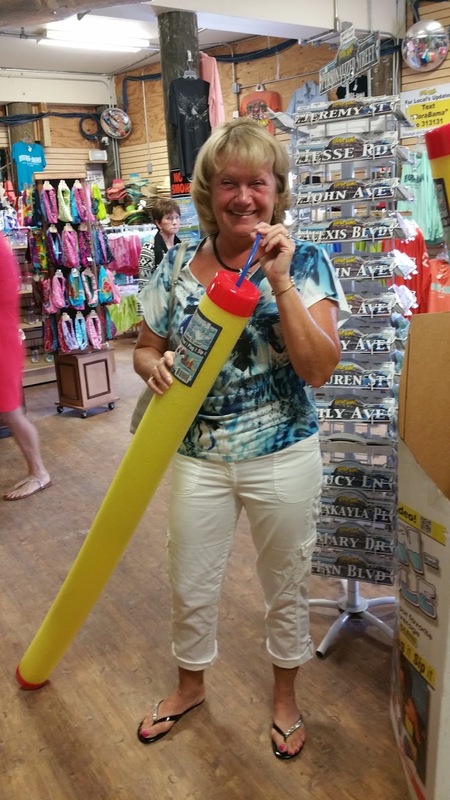 Pam is holding is a large swimming pool noodle that holds liquid to be sipped through the straw. Wayne asked Pam (upper right corner), "So where are all the bra-less women?" Ernie, Wayne and Pam turned their best sides to the camera. 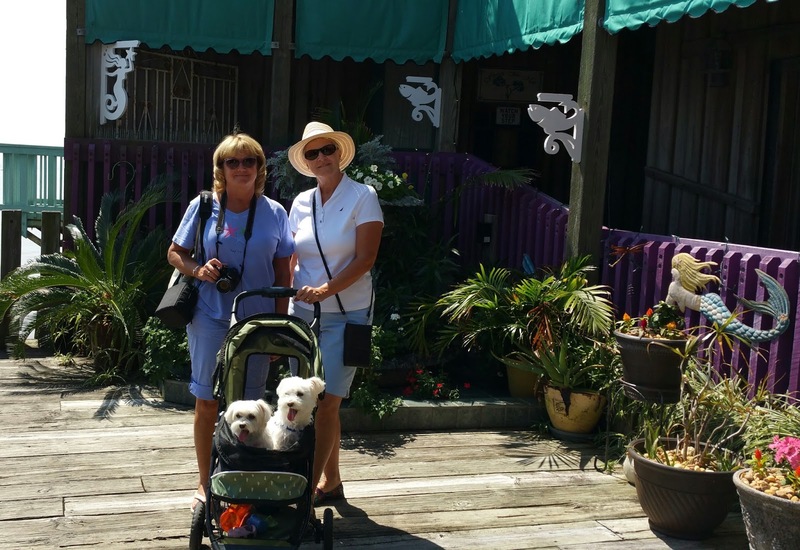 Our plan was to stay on at Gulf State Campground in Gulf Shores for a few days, but we got word that Pam and Ernie might have a buyer for their home and they will want to get back to tend to that business. They also want to stop in at Red Bay for service on their coach. Wayne and I went for a rainy day of shopping when I got a call that my brother passed away. I was not surprised but I was not prepared either. I would never be. We left Gulf Shores the following morning, headed to north Alabama.